The Woolsey Fire of November 2018 has burned nearly 100,000 acres of land, including 20,839 of the 23,621 National Park Service (NPS) owned acreage within the boundary of the Santa Monica Mountains National Recreation Area (SMMNRA). Other partners in management of the SMMNRA include California State Parks, the Mountains Recreation and Conservation Authority and the Santa Monica Mountains Conservancy. The Western Town at Paramount Ranch was destroyed. The only buildings left intact are the church building and train station. The NPS has announced “The Paramount Project” campaign to raise fund and rebuild Western Town in 24 months. Also destroyed was the residence of a park ranger. NOTE: PARAMOUNT RANCH WAS RE-OPENED TO THE PUBLIC ON 12/3/18. The aftermath at Paramount Ranch’s Western Town. The Morrison Ranch House in the Cheeseboro Canyon area of Agoura Hills, was destroyed. Rancher John Morrison and his family occupied this house in 1904 and lived and worked in the home for nearly 60 years. The original ranch house, modified over the years, dates back to the late 1800s. It is now gone. Morrison Ranch House one year ago - November 2017. Peter Strauss Ranch was decimated by the Woolsey Fire. The Rocky Oaks ranger residence and archives building were destroyed and Rocky Oaks park was just devastated; you can barely recognize it. The Arroyo Sequit ranger residence was destroyed. The National Park Service’s Santa Monica Mountains National Recreation Area website at www.nps.gov/samo/index.htm will post updates. 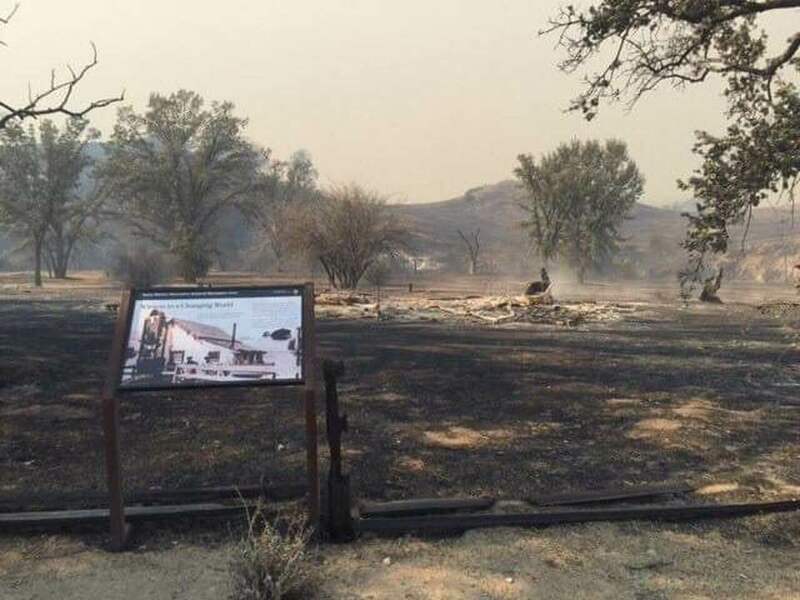 Other structures destroyed in the Santa Monica Mountains falling into lands maintained by other organizations include the historic Sepulveda Adobe, Red House, White Oak Barn and Reagan Ranch. Malibu Creek State Park updates at www.parks.ca.gov/?page_id=614. KTLA reported on November 11th that the Woolsey Fire also destroyed the MASH set. After the park reopened on December 18th, I checked it out and found that nearly the entire set is still there.. The iconic sign is still in place, though it is barely readable and needs some work. Iconic sign post Woolsey Fire. Faded but still standing! Iconic MASH sign last March. NOTE: THE TAPIA DAY-USE AREA WITHIN MALIBU CREEK STATE PARK WAS RE-OPENED ON 12/3/18. MALIBU CREEK STATE PARK DAY-USE AND BACKCOUNTRY TRAILS REOPENED 12/18/18. CAMPGROUND REMAINS CLOSED UNTIL FURTHER NOTICE. Also temporarily closed, but not on fire, include Point Mugu State Park, Malibu Lagoon State Beach, Point Dume State Beach, La Piedra and El Pescador Beaches and Topanga State Park. THESE WERE REOPENED 11/27/18. The Mountains Recreation and Conservation Authority announced a number of parks it manages are closed as a result of the Woolsey Fire, including Escondido Canyon Park, Las Virgenes View Trail, Triunfo Creek Park, Upper Las Virgenes Canyon Open Space Preserve, Charmlee Wilderness Park, Zev Yaroslavsky Las Virgenes Highlands Park and others. (Updates at mrca.ca.gov/press/mountains-recreation-and-conservation-authority-issues-list-of-park-closures.) Amazingly, while much of Charmlee was burned, the structures survived. UPDATE 1/11/19: MRCA ANNOUNCED ALL OF THE ABOVE TRAILS, WITH THE EXCEPTION OF ESCONDIDO AND CHARMLEE, HAVE REOPENED. On to Camarillo…Camarillo Grove Park sustained fire damage from the Hill Fire and is closed until further notice. Updates at www.pvrpd.org/parks/dog/grove.asp or 805.482.1996. MASH set at Malibu Creek Park in pre-Woolsey Fire days. Reagan Ranch house in pre-Woolsey Fire days. Charmlee entrance is greener, yet still dry, times. The replica Chumash Village at the Chumash Indian Museum / Oakbrook Regional Park was destroyed by the Woolsey Fire, which is so unfortunately as the place was just magical. However, most of the beautiful oak trees canopying the grounds were saves. Kristy’s Roadhouse Malibu and SIP Malibu at the corner of Kanan and Sierra Creek Road were destroyed by the Woolsey Fire. Simi Valley and Oak Park: Update 12/7/18 - RSRPD indicates Challenger Park in Simi Valley and Eagle View Park in Oak Park remain closed. The public is asked to stay out of Corriganville Park, the Wood Ranch Trailhead open space and trails west of the Long Canyon Trail. Oak Canyon Community Park, including the dog park, are closed until further notice. Updates at rsrpd.org. Calabasas: The Calabasas Bark Park at 4232 Las Virgenes Road is currently closed as a result of the Woolsey Fire.